Was that few days of hiatus too much for you to handle? Were you missing the Week of Shimmer? Are you completely confused about what a "Week of Shimmer" is? If you answered "yes" to my last question, I highly recommend you check out days one, two and three before reading today's post. 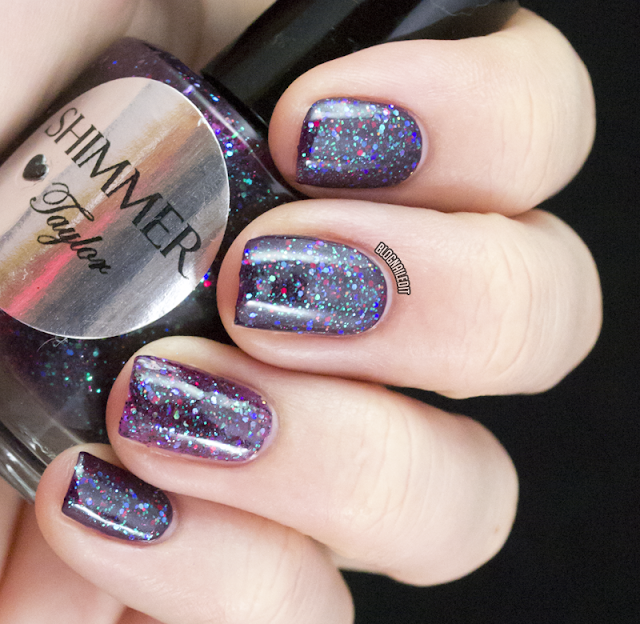 It'll fill you in on what this Week of Shimmer is, and why the swatches look the way they do. First up tonight is Tammy, shown over My Boyfriend Scales Walls (OPI). 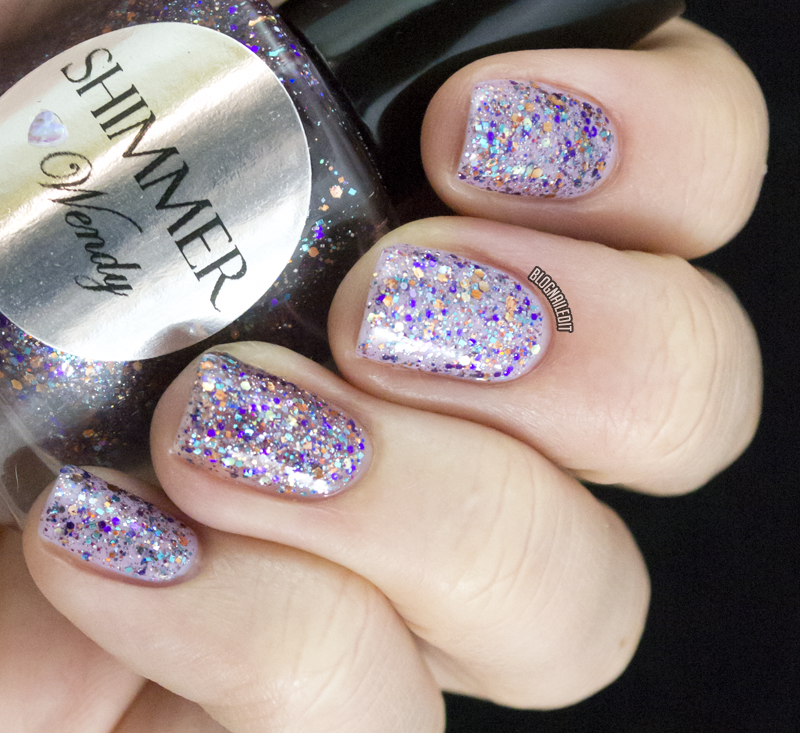 This is a unique glitter compared to most, as it has some bar glitter. I love the amount too...it's Three Little Bears just right! Tammy is a gold and purple glitter with black and holographic gold accents. Taylor is another odd ball. This uses a very dark magenta jelly base, and mixes in green, purple and red glitter. I've used it over Monica (Zoya), but you can hardly tell there's a difference! 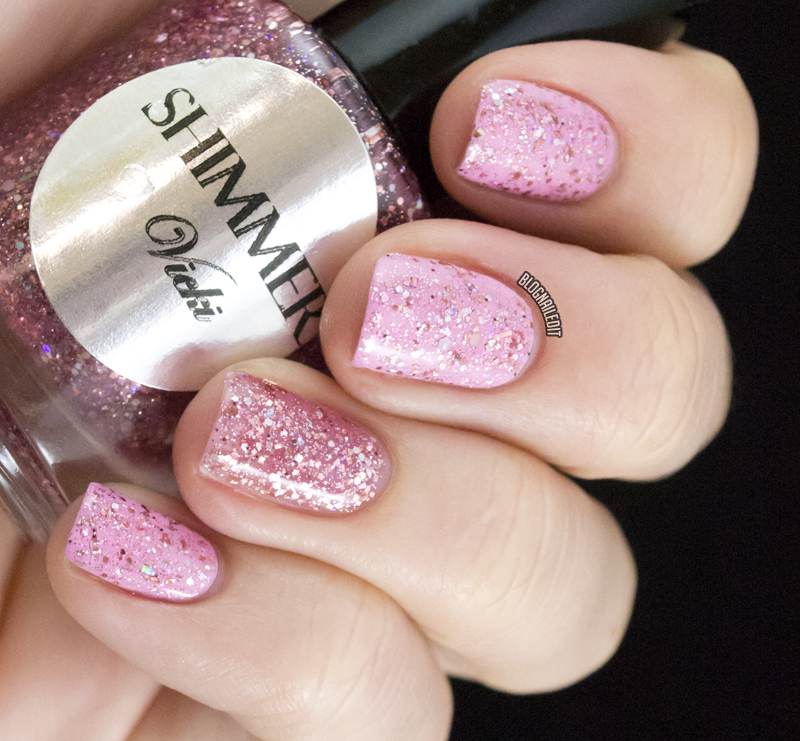 Vicki is another pink glitter mix, in a slightly pink base. It's speckled with shards of iridescent pieces, but it's almost entirely pink. I used it over Mod About You (OPI). Finally tonight there's Wendy, a total party mix. With pieces of royal purple and lilac, and accents of gold and teal, it really looks great! I used it over Walking on Air (Precision Lacquer). I know that tonight there's only 5 Shimmer Polishes, but that's because tomorrow, I'll be showcase my picks for Christmas colors! You don't want to miss that! And as always, all the polishes are available in the Shimmer Store for $12, and custom mixes can be discussed with the store owner, Cindy, for $15.